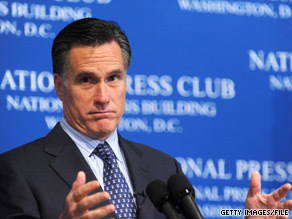 Mitt Romney is calling for President Obama’s health care plan to be repealed. Washington (CNN) - Mitt Romney, who as governor of Massachusetts implemented a health care plan that some liken to the legislation just passed by Democrats in Washington, is calling for President Obama's plan to be repealed. Romney, a potential 2012 presidential candidate, responded on Monday to the new health care legislation on the National Review's Web site. The president, he wrote, "has betrayed his oath to the nation" by failing to attract any Republican votes for the bill. "America has just witnessed an unconscionable abuse of power. President Obama has betrayed his oath to the nation – rather than bringing us together, ushering in a new kind of politics, and rising above raw partisanship, he has succumbed to the lowest denominator of incumbent power: justifying the means by extolling the ends. He promised better; we deserved better. "He calls his accomplishment 'historic' – in this he is correct, although not for the reason he intends. Rather, it is an historic usurpation of the legislative process – he unleashed the nuclear option, enlisted not a single Republican vote in either chamber, bribed reluctant members of his own party, paid-off his union backers, scapegoated insurers, and justified his act with patently fraudulent accounting. What Barack Obama has ushered into the American political landscape is not good for our country; in the words of an ancient maxim, "what starts twisted, ends twisted." "His health-care bill is unhealthy for America. It raises taxes, slashes the more private side of Medicare, installs price controls, and puts a new federal bureaucracy in charge of health care. It will create a new entitlement even as the ones we already have are bankrupt. For these reasons and more, the act should be repealed. That campaign begins today." More loathsome lies from the Party of No. Earth to Mitt. Your party decided to do anything and everything to oppose health care reform from day 1, calling it "Obama's Waterloo." Remember?! And now your lie is beyond the pale. Your party has personally threatened any and all moderate Republicans who even thought of voting for this legislation. The reason it's not bipartisan is because your loathsome extremists would not allow it, you know, the Rush Limbaughs, the Glenn Becks, the real folks who lead your party. This opposition took the form or lies (e.g. death panels), hypocrisy (your pretending to be on the side of seniors and medicare, when in fact the Republican platform would repeal Medicare in a heartbeat if it could), more hypocrisy (your basically opposing exactly the bill you signed into law in Massachusetts), inciting violence (getting your "base" to bring guns to anti-healhcare rallies), and most recently, obscene racist epithets hurled at African American members of Congress as they walk down the street. Your Party fondly calls these racist nutjobs, "our base," so don't go pretending that you can distance yourselves from them, or that they're a few isolated instances. They are what your party has become. Gone is the Party of Rockefeller; heck, even Ronald Reagan is too liberal for today's Party of No. Question to you, MItt. Why do Republicans so hate America? Look at that. Health Care reform passed. The stock market is up, and most large health insurance companies' stock is either up or basically unchanged. Hmmmmm....maybe capitalism isn't going to end. Did the republicans lie to us???? I'm shocked (not)! I cannot WAIT for November !!!!!!!!!!!!!! I wish it were NOW! So this Republican criticizes Obama for not enlisting any Republicans in support of the health bill. Of course, no Republican would have voted for that bill no matter what it contained. Republicans are committed to defeating this President's program – not particularly because they oppose it but because they want to win future elections. If Obama fails, Americans will vote for "the other guy." The other guy, in this case, will be a Conservative. Conservatives negotiate like North Koreans. They want you to give them things and they don't want to give you anything. That is because giving up their nukes will reduce N. Korea's bargaining power. They don't care if it is good for Korea or the world. In the Republican case, better health for Americans will not help them win the next election so they oppose it. "Failing to attract any Republican votes" says more about the Republicans failing our nation than it does about the President "betraying" his oath. Romney shut up will you. Mr. Romney, even you, Mr. Rich Guy, wouldn't have luck attracting obstructionists. The President did his best, while you and your colleagues stood on the sidelines and complained and pouted. We all know you are experts at both. Romney will never be President, so he can stop pretending that he cares about people. And if he knew anything, he would know that this health care bill will not be repealed. Why do you think the President has a veto pen? The Republican are past being jokes. They are a disgrace to this nation. I am embarrassed everytime one of them opens their mouths. The Republicans simply refuse to participate in the governing of America as long as President Obama is leading the country. The failure to attract any Republican votes to a bill that was essentially what the Republicans originally asked for in a health care bill says nothing about the President. It says that Republicans are primarily interested in making the President look bad to improve their chance of getting re-elected, and care little about the future of our country. What Obama actually promised was to take action...he way of doing that was to try and bring the politicians together. With the silent pack among republicans to NEVER support Obama, the may not be able to maintain the path he would have liked to take to get things done but he certainly has not failed to deliver now, has he. My respect for Romney has plummeted with this bush league tactic. Shame, shame. Mr. Romney should be ashamed of himself. Now that we have the long awaited, tested health care legislation passed it is time we go forward. It is not time to blame the president for not garnishing any Republican votes. The Republicans were all blame, spreading fear like wild fire and pave the way for what they call a sweeping voter ramification on the democrats in the 2010 elections. Republicans had all the time in he world to come up with a solution. They cannot cannot blame anyone except there party for not playing bipartisanship instead of trying to derail the process. what happened to the idea these country was founded to help the needy and the once in need of help. As an American citizen, proud to be one it was a glorious day finally to see us join the rest of the industrial countries. Politicians should listen to there hearts and do what is good for the country. I admire all those who voted for the health care bill, stand strong and dig deep down in there hearts and do what is good for the country. we always talk about taxes and the burden our kids will be left with. I understand that but is also to very important and a must to keep our citizens healthy, be able to work and be a productive society. Mr. Romney I just do not see your logic. God Bless our country and the health of our people and the needy finally has reached a milestone. Mitt shut up. You are a loser and Obama is a winner. Isn't that obvious? He definitely betrayed his oath of office which was expected from the time he announce for the presidency. He also has betrayed most of his campaign promises except for the money and power he has given to the unions. I saw Pelosi saying that this new giveaway of taxpayer money to the non productive products of the NEA will cover the children. I thought that what was what the SCHIP program was for and why we saw cigarette taxes raised so sharply in one of Obamas first lies. Was I wrong or will we now see a tax reduction. Why was the doctor fix not part of the money calculation? How come we wil end of paying 10 years worth of taxes for six years benefits? A lot of people can figure out the answers to these questions and they all point to Obama and the Democrats lying to America. So incredibly stupid coming from a man who enacted universal healthcare when he was governor of MA. Does Romney even hear himself? He is a complete hypocrite and blantant flip-flopper. How come it was Okay for him to do the same thing in Mass. but wrong for President Obama to do it for the entire country? Hypocrisy – thy name is MITT. Hey, Mitt - bipartisanship takes the cooperation of two parties, and the Republicans never showed up except to say "no" to everything. The country has to move forward even if the Repubs want to stay stuck in the past - and in denial. This vote will be a badge of dishonor for the Republicans for generations. Shame on them. Isn't there an old saying, "You can bring an elephant to water, but you can't make it drink?" One thing the protracted Health Care Reform debate has accomplished is to clearly identify what the Republican Party has become. John Boehner, Mitch McConnell, Jon Kyl, Michael Steele, John McCain, Sarah Palin and several others are all obviously owned and controlled by the few, just as GWBush and DCheney were. As their voting clearly demonstrates, the entire Republican Party seems to have become totally intimidated and completely controlled ‘puppets’ with their consciences put aside; they have literally come to be dependent on and subordinate to the power, influence and substantial wealth of Special Interests and a select few. It is a despicable accusation yet it is regrettably thoroughly substantiated by their actions: nothing they advocate benefits the people; everything they offer always favors the select few; and whatever they say is aggressively presented, empty subterfuge that is arrogantly offered without any conscience – the con. They repeatedly use misinformation trying to excite people and then attempt to claim that people are upset and use that to their advantage. Their whole intent is very apparent as wanting to return to ‘more of the same’ that has already cost us so much; their entire concentration is on their political ambitions at any costs; their every effort is to say/do whatever will serve their purposes; they constantly attempt to block all progress/change and then to fault the Democrats; and the party bosses actively intimidate and coerce their own people to maintain total party unity. When people are objective and can deflect the deceptive appeals aimed at individual biases, prejudices, emotional attachments and loyalties the reality becomes very clear. We need the Republican Party to once again become honestly and responsibly focused on the needs of the people instead of just screaming self-serving liberal accusations and conservative hypocrisy while they continue to patronize and placate the few, their strong supporters. The only way to accomplish that is for the voters to recognize and firmly reject what they have become. Any ‘more of the same’ would be a total disaster.